Summer is a great time to enjoy the outdoor lifestyle, but that doesn’t mean you can relax all the time! Warmer weather is also the perfect time to re-coat your Adelaide deck as it will dry quickly, giving you and your outdoor furniture quick access. Before you get out the oil, brushes and deck applicator, there are a few things you should do first. Start with a thorough inspection of your Adelaide deck, looking for issues such as worn or rotting timber, stains, sags and exposed nails. After fixing any issues, sweep your deck with a stiff broom and then clean the deck with a commercial deck cleaner to remove dirt, grime and oxidation. Once your deck dries you can then start oiling. 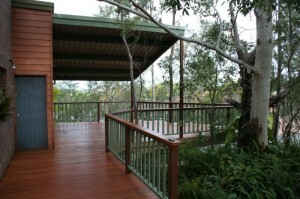 Oiling a deck is relatively easy – simply apply the oil liberally along the entire length of your timber and check for any areas where the oil has pooled, back-brushing if necessary. You should apply two coats of oil, a job you may be able to complete in a day, depending on the oil you choose and environmental conditions. For more tips on designing, building and looking after your Adelaide deck, go to our website (Adelaide deck) or phone us on 1800 601 674.